From the moment you say yes to your first step down the aisle, you want to remember everything about planning your wedding: the first bridal magazine, the phone calls to your mom asking for advice, finding your dress, testing cake. Each part of planning your wedding will create special memories that will stay with you forever. Of course, every big moment of the wedding day will be captured by photographers but it is also important to save the memories of the time during which you were engaged and planning the wedding. There is so much excitement, anticipation and yes, stress too, but the joy and love you feel during that time is unlike any other. Throughout the planning, you can hang on to different items and reuse them to help treasure those lasting memories. The kinds of things that are fun to hold on to are receipts, magazine pages, and trinkets that will remind you of the places you went to and things you did to help make your dream wedding come to life. One example is if there was something you saw in a magazine that was the catalyst of your entire wedding theme and design plan, that is great to hold on to. Another idea of something to keep is the receipt from the celebratory drinks you and your girls got after choosing your dream wedding dress. More examples include a napkin from your cake tasting, a brochure from your venue or a dried flower from the flower shop where you got your bouquet from. It’s also fun to document and take photos of each step along the way. This includes your dress shopping, your bridesmaids’ dress shopping, hair and makeup trials. And don’t forget to take photos of the different venues you visit and anywhere else your planning takes you. Now you may be wondering why I’m telling you to keep all this stuff, most of it seems like junk, right? Not exactly. After the excitement of the wedding calms down, you may feel like you need something else to plan and work on. That’s where all this stuff comes in. You can use it to create a scrapbook or shadow box or collage. Scrap-booking can require a lot of work and time but can also be very fun. 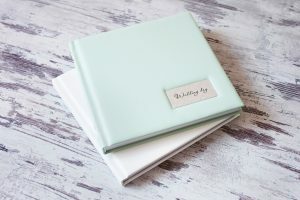 If you choose to do this, you can create a page for each event and really look back at each memory of the planning and development of your dream wedding. A couple of scrap-booking tips are to plan the pages ahead of time. Take an inventory of the items you have and plan out how many pages you will need and a general idea of what you want on each page. To have a cleaner look, keep the pages fairly minimal. If you try to jam too many items on each page, it will look cluttered and messy. One downside to scrap-booking is that it can get pricey. If you buy materials from places like Michael’s or JoAnn’s, make sure to check online for coupons which are almost always available. If you want to use your photos but don’t quite have the stamina or creativity to make a scrapbook, a great resource is Chatbooks, an app which will take your Instagram photos and turn them into a beautiful book. This option is easy and inexpensive! Another option is to create a shadowbox. These can be bought in many different sizes and used to create a 3-D collage. You can use things like the magazine page and brochure to create the background but then layer it with trinkets or photos. Probably the simplest, but still fun, option is to create a flat collage. This can be done on canvas or even card-stock that can be framed later. Either of these types of collages can turn out beautiful and do not take the same time commitment as a scrapbook. Plus, they can be displayed in your home so others can see the memories too! Planning a wedding is so fun but can sometimes be overwhelming. It’s easy to get caught up in everything and forget to step back for a moment and really enjoy it. If you are able to hang on to different trinkets and things that remind you of the fun moments, you can use them to create fun crafts that will be cherished forever. This collection of items and subsequent creation can be done by brides but it can also be a fun thing to do if you are a maid of honor or mother of the bride that can be gifted to the bride later as a very special and fun present.